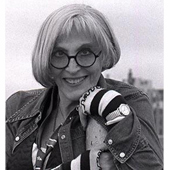 Transsexual writer and activist Kate Bornstein on her book Hello Cruel World: 101 Alternatives to Suicide for Teens, Freaks and Other Outlaws. Kate overturns the orthodox either-or labels of male / female and straight/gay/bi with her postmodern sexuality of self-definition and fluid identity. Kate is the author of the highly successful books My Gender Workbook and Gender Outlaw: On Men, Women and The Rest of Us, and her new book takes a transgressive and honest approach to what it takes to stay alive in a crazy world. You are by far my favorite hero. I love you. Your book saves my life damn near everyday. Ian, if you’re ever in a position to read this, thank you so much for giving it to me. Stay insane.